Mike Connell is a married father of two and has lived his whole life in Pittsburgh. He’s an exercise physiologist who works in clinical training, where he helps people lose weight, quit smoking and manage stress. He has been interviewed in many Pittsburgh publications and has appeared on local news programs concerning wellness. Through the years, Mike has also worked as a movie usher, janitor, box boy, videographer, video store clerk and printer. He has done location scouting, voice work, and sound Foley on a full-length independent film shot in Pittsburgh. 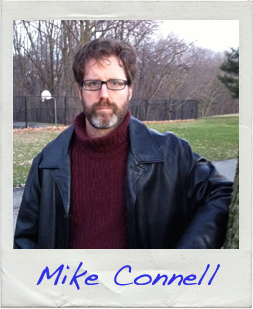 Mike is an avid reader of many genres and also a fan of all types of films, but he is an avid fan of horror movies. As a related hobby, he builds homemade Halloween yard props, such as dummies, mummies and tombstones. His collection of Silver Age Marvel comics is nothing to sneeze at, either. Read the first page of Mike’s story!